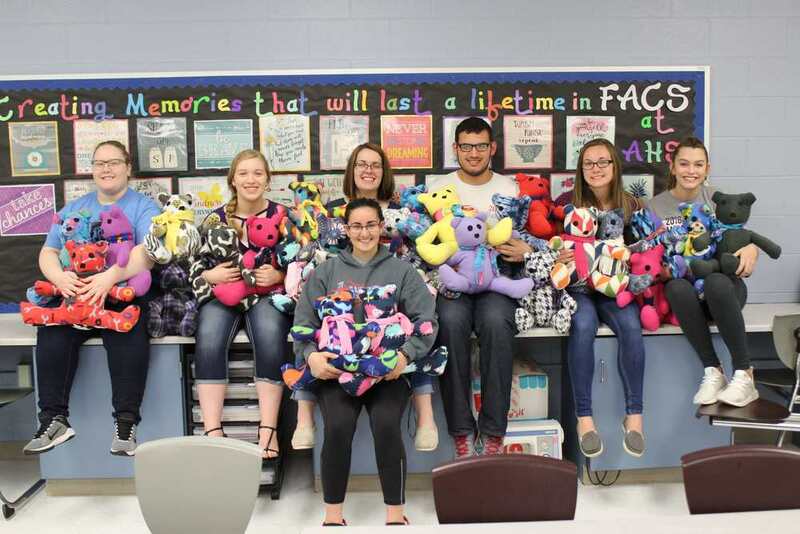 Big bags of bears were donated to the Alliance Police Department this week by Marikay Kuntzman’s high school Intro to Sewing and Family, Career and Community Leaders of America classes. Kuntzman came up with the idea to sew bears for children who come in contact with the police department in difficult circumstances. She approached School Resource Officer Hope Rummell who verified there is a need for the comfort toys for children. The classes used colorful uniquely designed felt to sew the bears. About 30 bears were donated and will be given to children who are being interviewed by police, are being placed into foster care or other emergency placement by police, are in a car accident, or even children who visit the police station for other reasons. For some children the bears may be the only thing they have when they are placed in a new temporary home. “Having something to take with them to each end every place they go is an emotional comfort to a child,” Officer Rummell said. The donation provided an opportunity for Rummel to explain to students the struggle children go through when removed from their homes or go through some other traumatic event. “At least this gives them something to hang onto when they feel so much stress, anxiety and sadness at one time,” she said. Kuntzman said she hopes to continue the project with future classes next school year. “It’s important for these busy kids to give back to the community,” she said. The bears were given to Rummell who works out of the schools and to the Juvenile Detective at the Alliance Police Department. Each bear has felt eyes and a nose as well as a small scarf. Students pictured: from left: Estealita Thalacker, Allie Cox, Siearra Naget, (front) Kate Boehm, Stefan Thalacker, Nadia Keppel and Tayla Tenney.